We at Trail Acc Trailer Manufacturers & Sales are builders of our own car transporter trailer for sale according to both SABS specifications and the standards of the National Road Traffic Act - build quality is guaranteed. These new trailers are heavy, duty double axle units with a carrying capacity of 2800kg. Designed to transport cars, bakkies and 4x4’s, the unit can be used as a flatbed trailer to move other heavy objects like Wendy Houses, palm trees and other large objects. 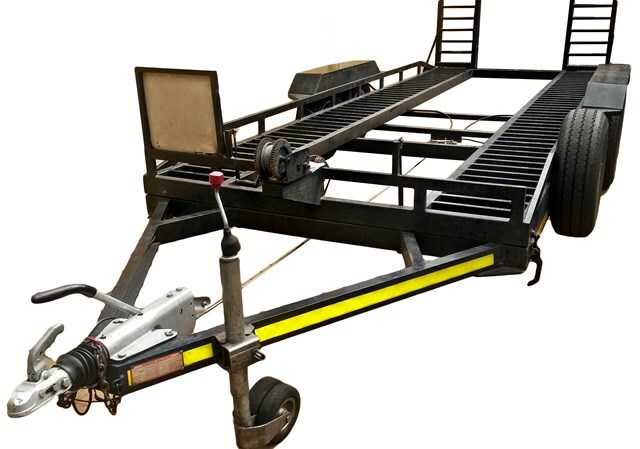 Drop-down ramps for easy loading and double axle with onboard brakes. Tow vehicle specifications: Cars, 1 Ton bakkies or 4x4’s with a minimum engine size of 2.5ℓ or larger. To buy your own car transporter trailer, contact us today for best prices. Our well trained sales staff will assist you.